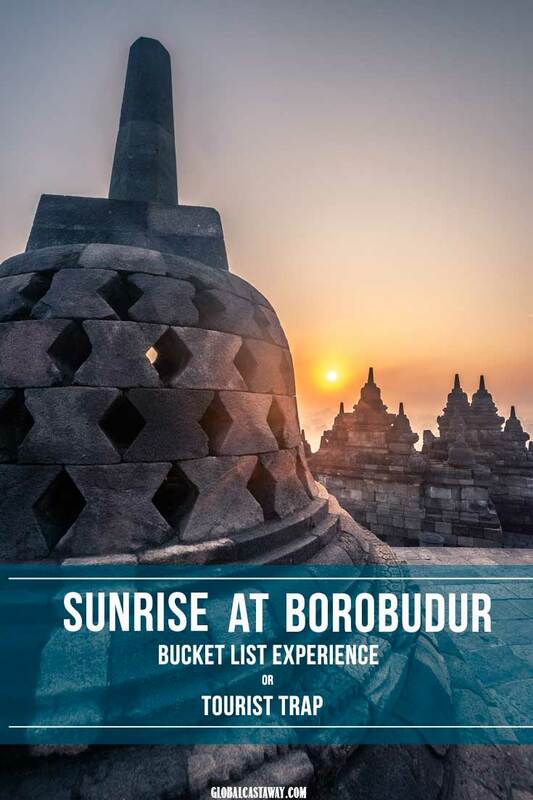 Experiencing the sunrise at Borobudur temple has been on my bucket list for years. 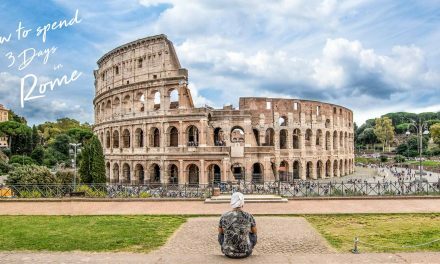 Actually, it has been there before I even knew what a bucket list is. It was maybe 15 years ago when I first saw a picture of the temple and its bell-looking stupas surrounded by misty jungles with the sun half risen behind a volcano in the background. 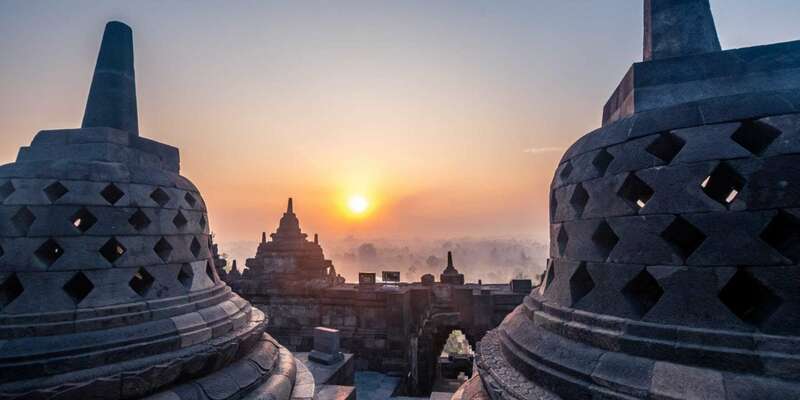 I had no idea what it was or where it was, but ever since then, when someone mentions Asia, adventure or jungle, this sunrise photo of Borobudur comes to my mind. How to see the sunrise without paying extra? 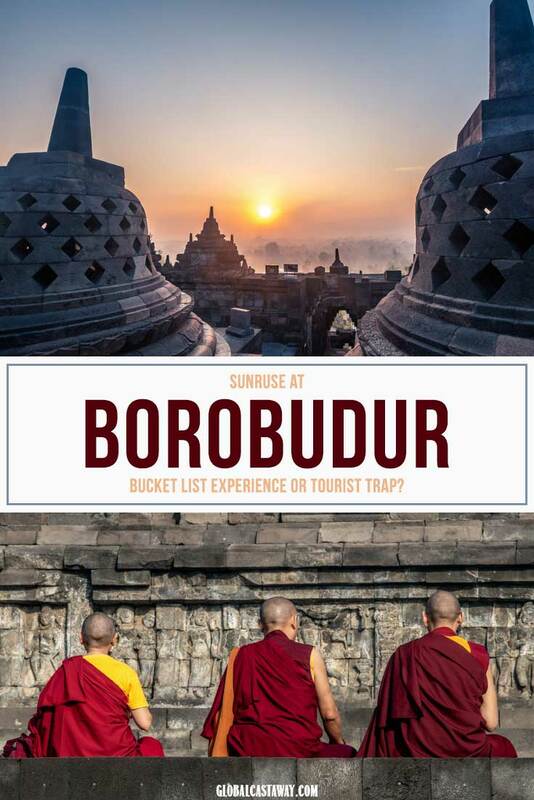 So is the sunrise at Borobudur a bucket list experience or a tourist trap? Even if you haven’t heard of its weird name, chances are you’ve already seen a picture of the temple. 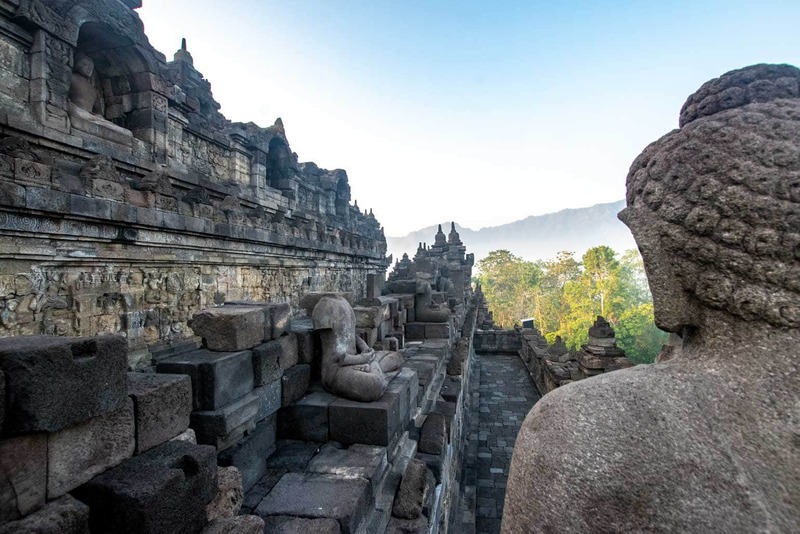 They have dragons, orangutans, volcanos and even Bali, in Indonesia, but the highlight that is used to advertise the country is usually Borobudur. 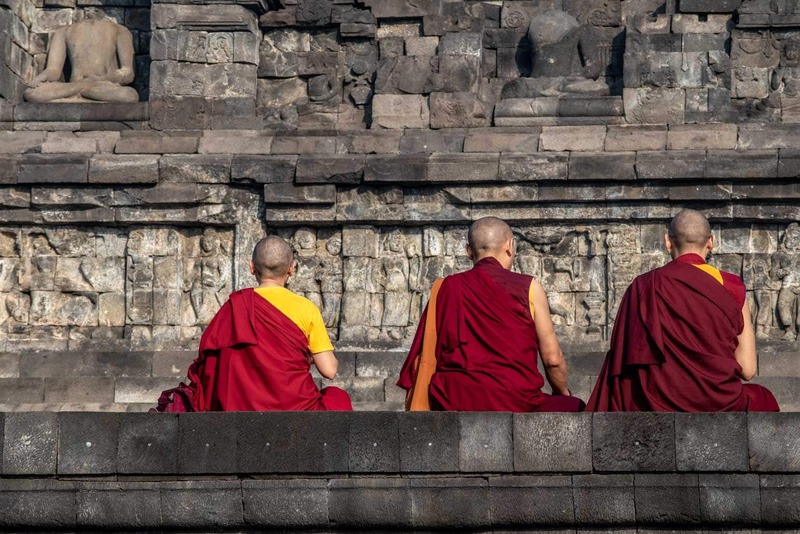 Not only the biggest Buddhist temple in the world, Borobudur is also considered to be the oldest one too. 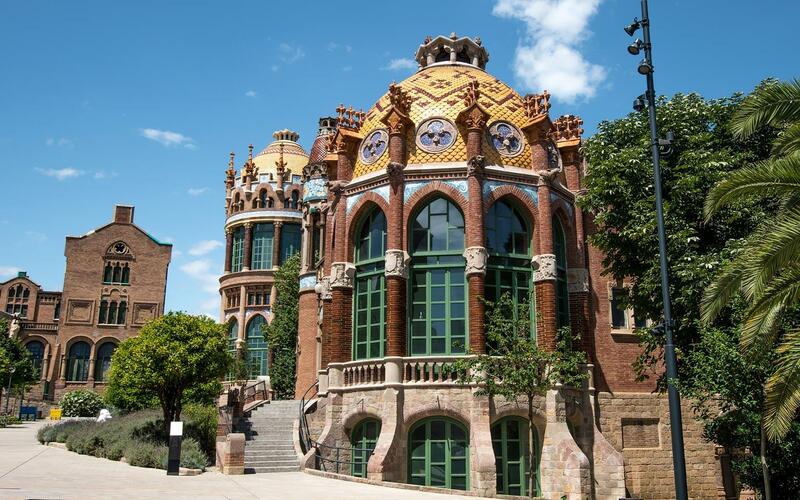 Built between the 7th and the 8th century it is estimated it took more than a hundred years to be completed. Temple was abandoned when the country converted to Islam, but in 1814, Sir Thomas Raffles rediscovered it for the world. 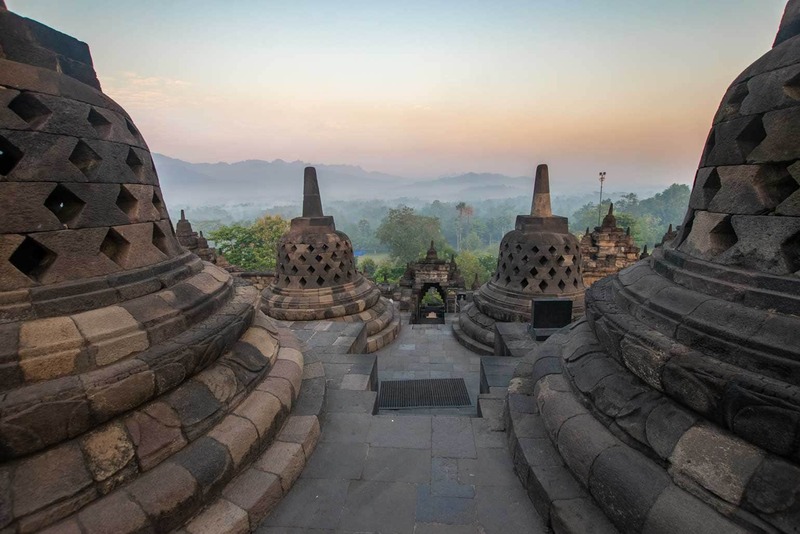 Multiple restorations have been made; the biggest one was handled by the Indonesian Government and UNESCO between 1975 and 1982. The temple is structured on nine levels that have 2,672 reliefs on their walls. 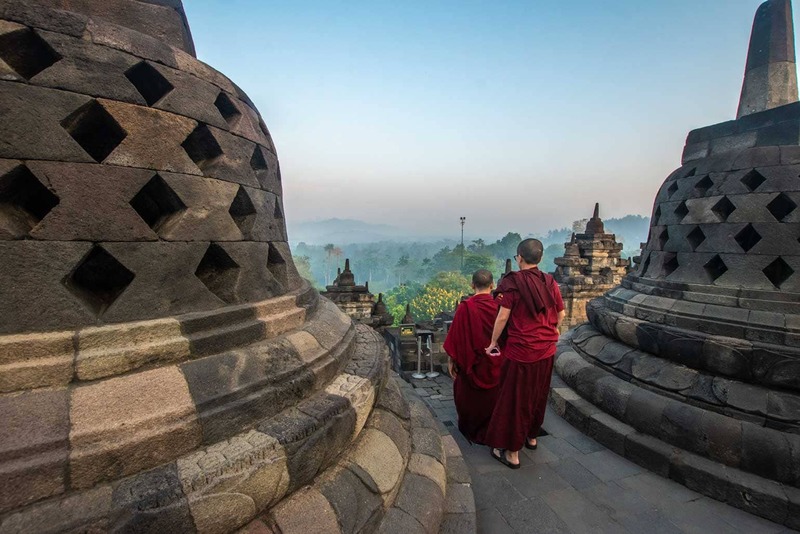 The most famous part of Borobudur are the top three floors with their bell-looking stupas. 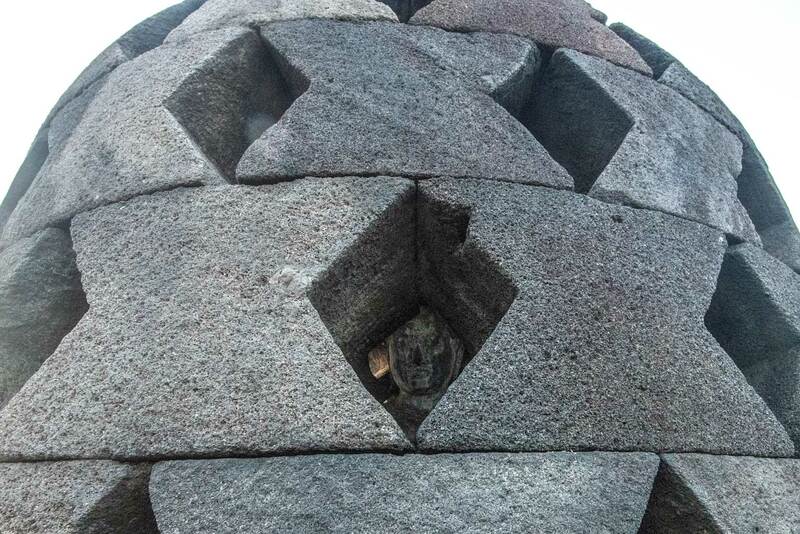 If you look through one of their holes, you can see Buddha sitting comfortably in a lotus position inside. The central stupa on the top of the temple signifies Buddha’s enlightenment and is a symbol of eternity. 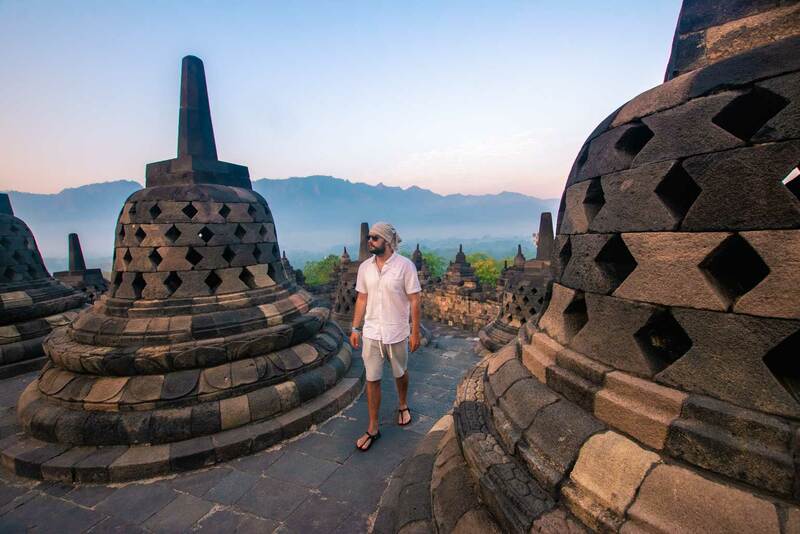 Although Yogyakarta has a lot to offer, my time in Indonesia was coming to an end, so my sole purpose of visiting the city was to recreate the sunrise at Borobudur experience. I had this adventure stuck in my mind, and even though my expectations were based solely on a 15 years old photo (ok, I did check more recent images too, and they are stunning as well) I was sure it’s going to be one to remember. The official temple opening is at 6 AM, so I had to go for the Sunrise at Borobudur ticket from the Manhoara resort. Manohara is located on the Borobudur temple property and is the only option for early access. I got a map and a torch, and 5 minutes later I was on my way to the top of the temple. 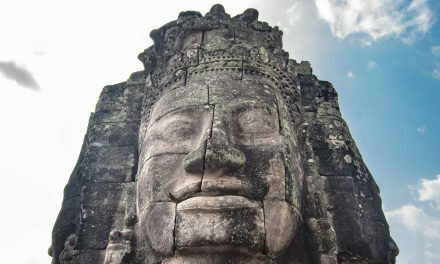 Read More: All you need to know about the Angkor Wat sunrise – the most famous sunrise in the world! Now here is something you should know about me – in my daily life I hate getting up early. When I travel, however, I cherish the opportunity to wake up before everyone else and have all the astonishing landmarks to myself. Well in Indonesia my waking-up-early-to-be-alone system failed me. First, it was mount Bromo and its rush hour at 3 AM, and now it was happening again at Borobudur. When I got up to the top, there were already a dozen people there. At the time of the actual sunrise, they were more than a hundred…far away from the secluded nirvana experience I had planned. 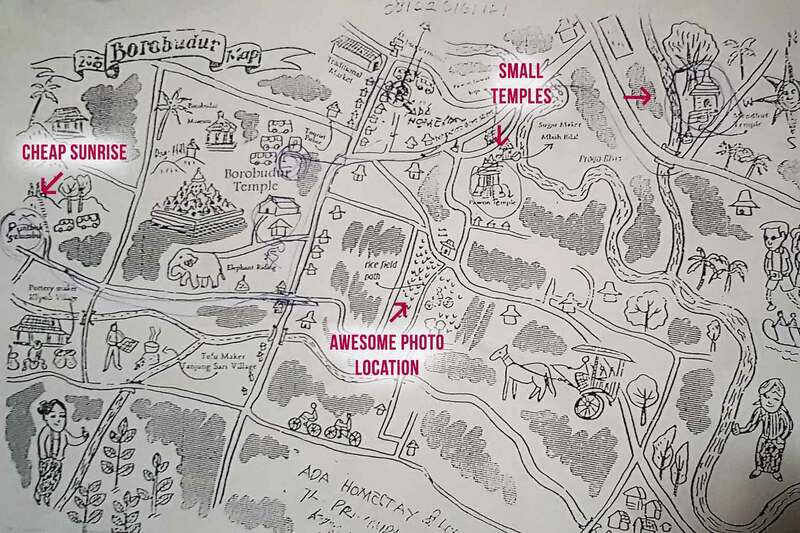 A good thing about Borobudur is that it has so many stupas and levels, it’s not that hard to find a place where people will be out of your sight. And since most of the visitors had the same intent of peaceful sunrise watching as me, there weren’t a lot of noises besides the camera shutters and some cranky roosters in the village nearby. Once the sun was comfortably up in the sky, it was time to explore the other levels of the temple. For those who skip the history of Borobudur part, this temple is the biggest Buddhist temple in the world, and it has nine pyramid layers. While I had seen the top three, but there were still six more to explore. Surprisingly they were free of people besides some casual monks examining antique Buddha statues. 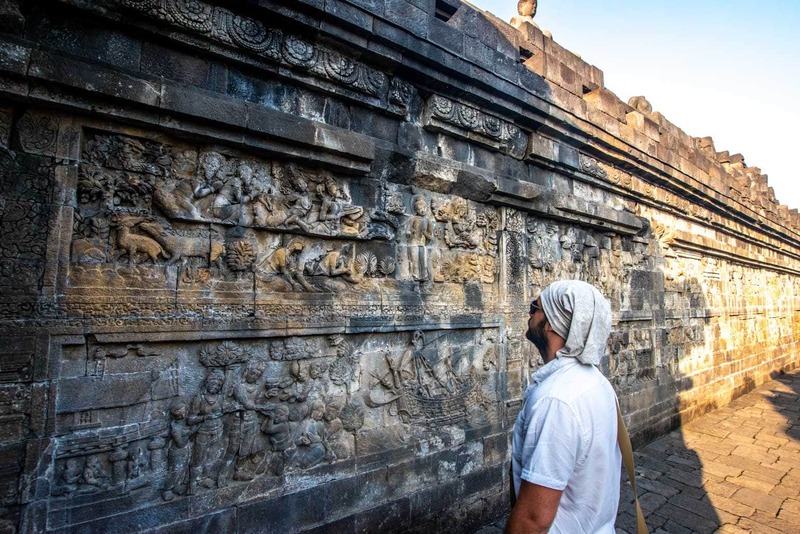 Ancient engraves covered the walls and while it wasn’t as colorful as the Egyptian tombs in Luxor, it gave me the same cool feeling of walking through history (if you are really passionate about ancient stuff, I suggest you hire a guide to explain the stories behind the carvings. I did regret not getting one). First, you need to make your way to Yogyakarta. 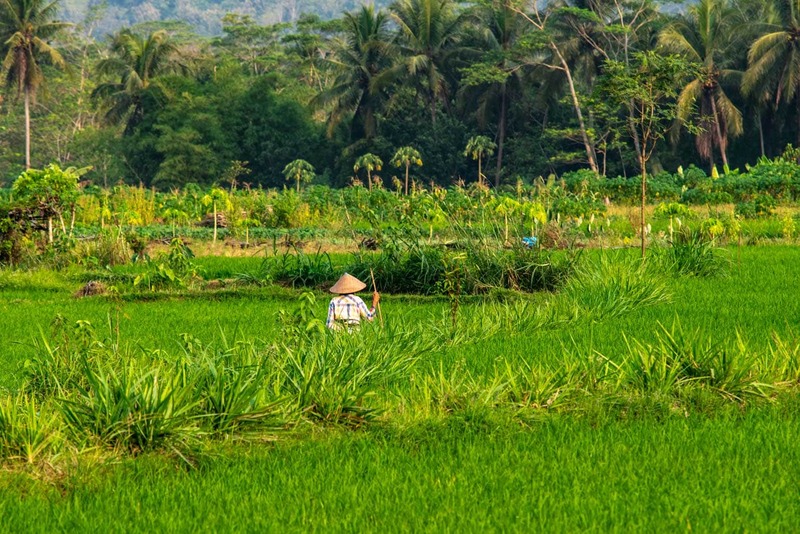 It’s a major Indonesian city, so there are plenty of options to chose from. You can fly directly from Bali or Jakarta or if you prefer trains, you can get one from any Java city to Yogyakarta from here. Next thing you have to decide is if you are going to stay in the city or in the village next to the temple. 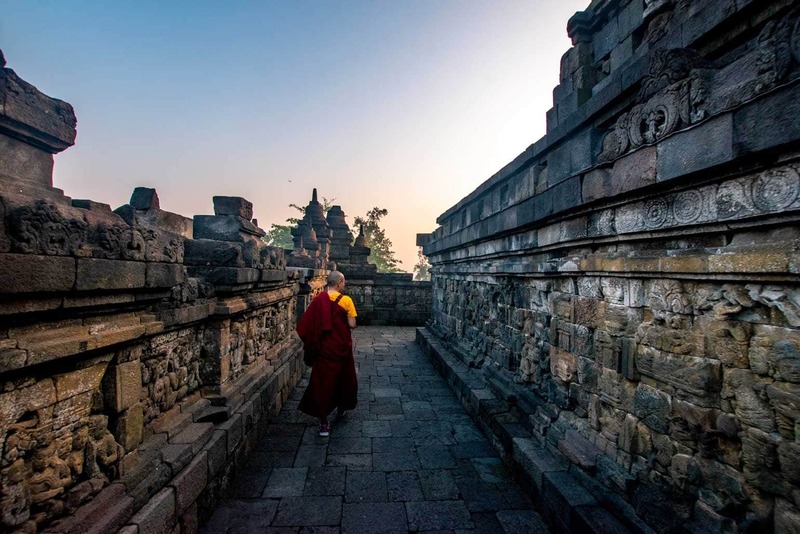 While Yogyakarta has quite a few things to see, Borobudur is situated way up north and requires 1-2 hours drive from the airport to reach it. So if you are going for the sunrise at Borobudur experience, it’s better to get a hotel next to the temple (that’s what I did). Due to been situated inside the Borobudur property, the best hotel used to be the Manoha Resort. However, it seems to be closed for accommodation right now. They still appear to be offering the sunrise access though. 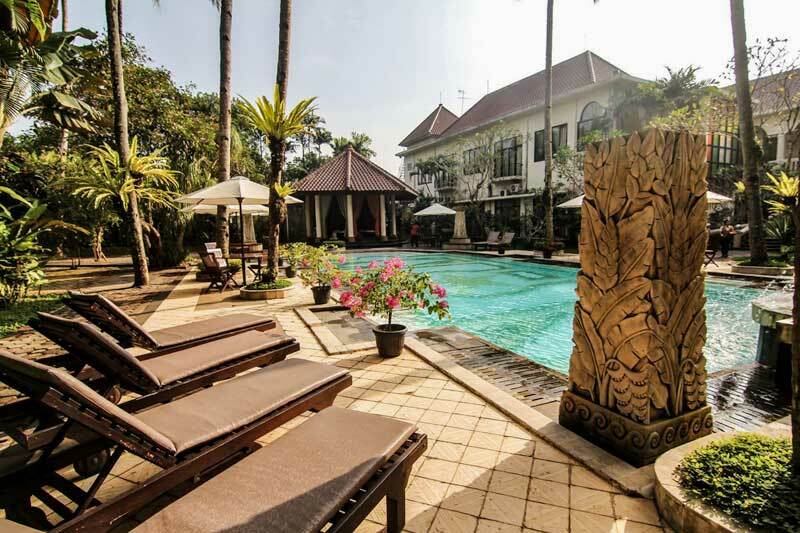 If you like to travel in style, Villa Borobudur Resort is your place. 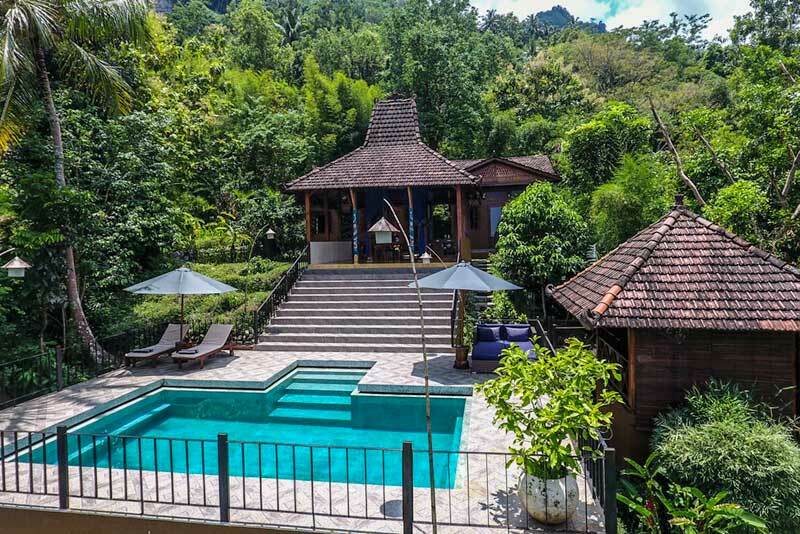 With its spacious verandas, private pools and panoramic rainforest view, the only downside of the Villa Borobudur Resort, is that you’d love your hotel so much, you may not want to leave too see the temple. Sarasvati Borobudur got everything you need without having to splurge for it. 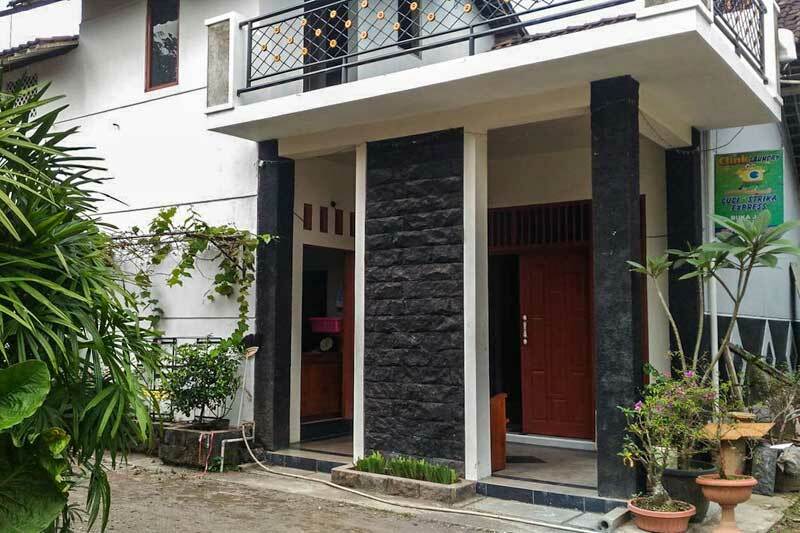 Cozy rooms, swimming pool, private parking and even Javanese art classes are offered. The best thing is that the hotel is situated right next to the temple so that you won’t miss the sunrise for sure! For the budget traveler, there are plenty of homestays in the area. I stayed in the Ada Homestay, and I enjoyed it. At 10 minutes walking distance from the temple, it has a perfect location and very helpful host who gave me a map of the area and answered all of my questions. 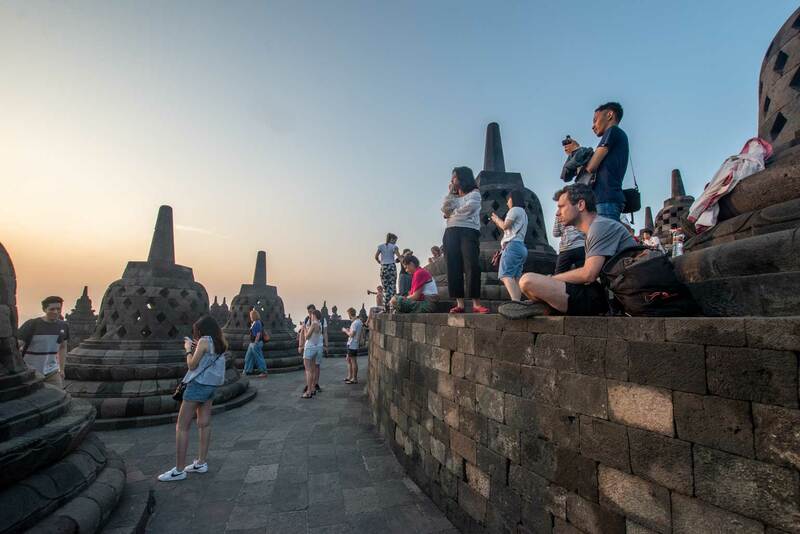 Regular working hours of Borobudur are from 6 AM to 5 PM. It’s possible, but only at certain times of the year. When the sunrise is around 5:50 AM you can get the standard ticket at 6 AM and rush to the top. I suggest to visit the Prambanan temple the day before and get the combo ticket, that way you won’t waste time at the ticket booth. Check out the sunrise times in Yogyakarta. 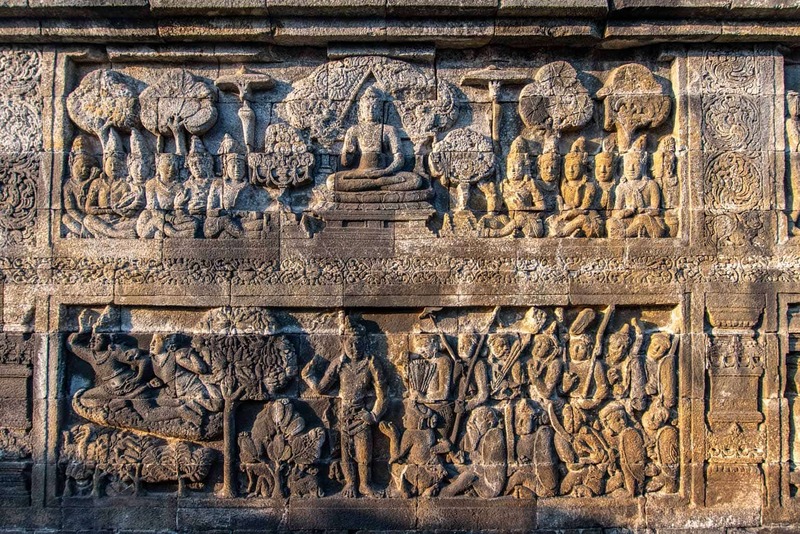 You can also watch it from the Setumbu Hills that oversees Borobudur. It’s less crowdy and way cheaper( IDR30K / 2USD ), but you’d have to walk more, and you won’t be able to take photos of the stupas. While it wasn’t exactly what I imagined it to be, I can honestly say I enjoyed the sunrise at Borobudur a lot, thus I’m putting it on my bucket list recommendations. 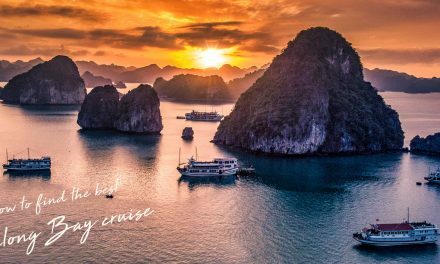 I have a slight suspicion the sunset may be the better option though, and next time I’m in Indonesia, I’ll try that for sure! That’s all from me, I hope you enjoy your Sunrise at Borobudur! 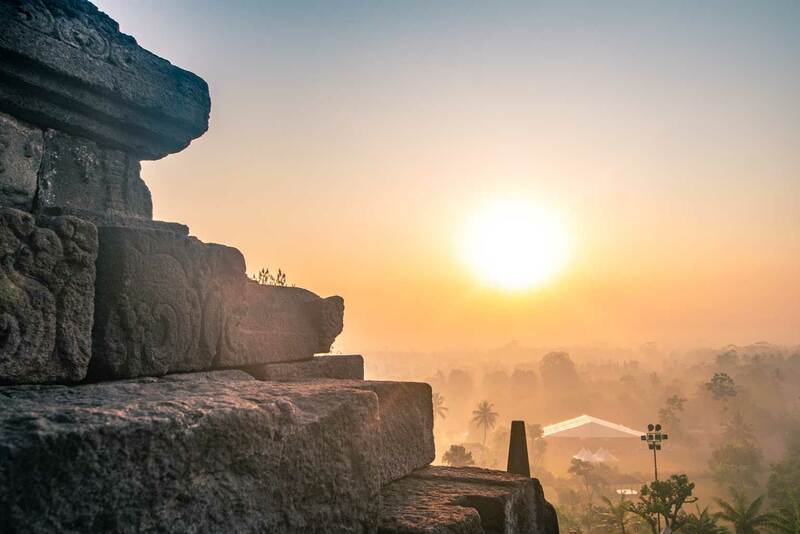 Is the sunrise at Borobudur on your bucket list too?